“Whale Rider” is about a young girl who, though having exhibited potential to be a great leader for her people during a time when a leader is desperately needed, is rejected by the rulers of the community because of her gender. These hints of her leadership are deemed sinister by the community leader who feels his people have already paid a heavy price for going against tradition - tradition dictates that a young boy will exhibit this potential. I am used to the story of the runaway - the kid who finds relief and acceptance in a new place. Usually the kid has a talent that is not recognized by their community – or a talent that the community finds threatening or burdensome. Like a young boy from a small mining town whose traits hint that he is a possible ballet genius during a time of the town’s economically devastating strike. But “Whale Rider” is a less familiar story for me: the disrespected and rejected kid who stays home. It seems like a harder story and a harder one to win. Pai, the young girl, stays where she is because her talents are in direct relation to her small shoreline community. Without her community, she is not a leader. She cannot go to the city to fulfill this specific potential. So she keeps pressing in. She turns down a chance for easy escape. She secretly learns the specialized rituals and ways of her people (the same ways that are used to reject her). She circles around her domain and gets close when she can. She is continuously persistent, continuously hurt, and continuously forgiving. The most uncomfortable part for me was not the main elder’s repeated rejection of Pai - but the image of them reconciled. It was hard to see this little girl sitting next to an old man who had thrown her out so many times. It is the best case scenario, and an important one, but I am still new to this story. Pai narrates the movie, explaining sympathetically why her grandfather thought she was of no use when she was born, why some people saw her as a curse, why she was lonely. 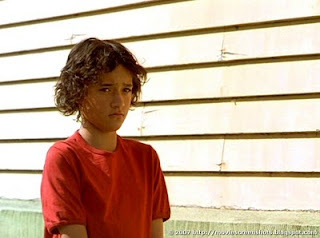 For me, the best thing about "Whale Rider" is that Pai’s narration subtly turns from the voice of a strangely sympathetic outsider into the voice of a sympathetic leader without her situation having yet changed in any way. A brave step either towards insanity or heroic leadership - but certainly the best and most reasonable action to take if there is nowhere else to go.